You calmly walk into the dentist’s office, child in tow, for that first appointment. You’re both ready. Yet, the moment your preschooler walks into the dentist’s office, sees the bright lights and hears the whir of the equipment, all bets are off. The fear sets in, and you’ve lost your cooperative, calm little one to a puddle of tears and flailing arms. If you have that first dentist’s appointment coming up, you are likely wondering what you can do to stop this scenario from happening. With these five tips, you can lessen your child’s fear and make that first trip to the dentist a positive one, setting the stage for a lifetime of good dental habits. Your child has times of the day when she’s more cooperative and happy than others. Mayo Clinic recommends planning your dental appointment, especially that first one, at the time when your child is the most likely to be rested and cooperative. Doing so will increase the chances that your experience will be a positive one. Many parents go into too much detail about what will happen at the visit. They warn of drills and water spraying in the mouth and masks on the dentist’s face. Doing so can increase anxiety. Instead, tell your child the bare minimum about what is going to happen, and then answer questions simply. 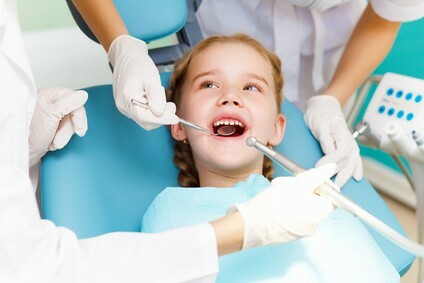 If your child has more complex questions, which is unlikely before the first visit, let the dentist answer them. Dentists, especially those trained to work with kids, are able to explain things in a way that kids will accept. While you don’t want to go into too much detail and make anxieties worse, you can help your child by doing some pre-visit prep. Read children’s books about the dentist, do coloring pages about oral health and keep dental discussions as part of your day-to-day talking. You can even explain some of the great things about going to the dentist, such as that shiny new toothbrush and the coveted prize from the prize box. If you’re looking for resources to use with your child, check out Kool Smiles. You can find them on Facebook, LinkedIn and Pinterest — they have excellent activity and coloring sheets parents can download. Check out MyKoolSmiles.com to downloads activities to do with your child at home before that visit. The words you use when talking to your child about the dentist need to be positive. Never say “hurt” or “owie” or “pain,” even though these could happen. Saying “It will only hurt a little” puts the idea into your child’s head that there will be pain, and that idea can escalate into extreme anxiety and fear, so don’t even use the word. Finally, the dentist you choose can make all the difference in having that first appointment be a positive one, so choose a pediatric dentist. The American Academy of Pediatric Dentistry indicates that a pediatric dentist should have the skills to assess your child’s development level and attitude toward dental treatment, and tailor the appointment to match. This will do more to allay fear and anxiety than anything you can do at home. Previous articleChildwise: Can Sports Be Safe?